The staff is specially selected for their leadership qualities, professional experience, and strong desire to share their profound passion for the natural world with the children. We pride ourselves on the individual attention we give to each child. 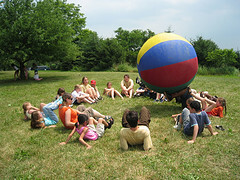 Our staff ensures that each camper experiences activities in which they find success. The staff include environmental educators, certified teachers, arts and crafts specialists, musicians, actors, storytellers, counselors, and counselors-in-training, Many staff were campers themselves, and return to contribute to the camp community. Our camp is unique in that the camper to staff ratio is consistently less than 10:1 and is frequently 5:1 or less. (One staffperson for each 5 campers or fewer) This enables all campers to receive the individual attention and respect they deserve. It allows for staff to take the time to interact with campers, provide focused direction and guidance, and participate in games and camp activities. This page is currently being updated with Biographies of our returning staff. Please check back frequently in the next several weeks as our camp counselors and instructors are confirmed and announced. We promise both old favorite camp staff, and fresh new camp staff this summer! Kate leads the camp community and designs the program. Kate has managed programs for children for twenty years, including 18 seasons of summer camp. This is her fifteenth season as Director of Free Spirit. She shares her understanding of ecology and respect for nature through unique, hands-on activities that emphasize cooperation and healthy physical and emotional development. Some of her favorite camp activities include fire-making and outdoor cooking, puppet-making, tie-dying, parachute games, adventure challenges, cooperative and multicultural games, and learning about birds. In 2012 she co-founded The Birch School in Rock Tavern, an alternative school program and homeschool resource center. The Birch School offers individualized learning programs for students from 5 – 17. Kate has directed summer camp and afterschool programs for the YMCA, the Boys & Girls Club, and other Youth Service organizations. She has been trained at the Vermont Wilderness School in the Art of Mentoring, an approach to environmental and cultural mentoring. She is a member of the Town of Wallkill Conservation Commission, A volunteer for the Basha Kill NatureWatch program, and a Board Trustee at the Interactive Museum in Middletown. Kate recently earned a Masters Degree in Environmental Conservation Education at NYU. , Kate can be found hiking, reading up on 21st century learning, playing djembe, cooking, learning to code, looking at birds with binoculars, finding materials to make cordage, and learning to use her new camera. Ed is the Camp Manager, responsible for all aspects of the physical facility. He has an MAT in history and BFA in music. He is looking forward to sharing his extensive map and geographic skills with campers, having traveled and hiked all over the region for many years. He is also an accomplished musician and singer-songwriter, and shares his passion for music with campers, especially at All Camp Circle. Ed offers hiking, map skills, plant identification, basic woodworking, drumming and music. He organizes outdoor construction and maintenance, and coordinates transportation and trips for camp. During the school year he is Conservation Education Coordinator and cartographer at Orange County Water Authority and is Math and Social Studies Teacher at The Birch School. Gaye will be working with us again as Registrar and Program Director. Gaye is responsible for the registration process and assisting families to enroll in camp. Gaye also plans the extensive crafting activities, ensures our craft supplies are available and in order and introduces new crafts and materials to campers. Gaye has been a part of camp since her daughter Alyssa began to attend camp nearly 17 years ago. Gaye helped to found the Birch School in 2012, and continues to teach Math and Science during the school year to students at The Birch School. Gaye is an avid crafter, and teaches quilting and sewing classes for children and adults at Quilter’s Attic in Pine Bush. She enjoys her Lab Diesel, Golden Retriever Cody, as well as hiking and traveling to the Jersey Shore and Rochester to visit family. Rebecca returns this summer as Special Activities Director. Rebecca works as the Primary Teacher at The Birch School, for a class of 5 – 9 year olds. She has 15 years experience with children’s programming, having worked at the YMCA, Boys & Girls Clubs, School Districts, and summer camps. She has taught Phys Ed. to elementary students, coordinated sports at a sleep-away camp, and taught summer Science classes at the Interactive Museum. She is especially skilled at leading team-building activities, and promoting character education.